Si vous avez un grand groupe c'est la maison pour vous. Il y a beaucoup d'espace pour tout le monde. Il ya une grande cuisine avec tout ce dont vous avez besoin. Une belle salle à manger avec une autre table sur le pont. Toutes les chambres sont spacieuses et propres avec de beaux draps et des édredons.
. Foyer, sabots, crochet .......... relaxant et privé! Fermez la porte pour le rendre encore plus privé. La maison est située au centre de tout. 25 minutes de l'aéroport, 12 minutes du parc du glacier, 5 min. au réservoir Hungry Horse, à 3 km de l’épicerie, des restaurants, de la boutique de souvenirs. Chemins forestiers situés à 400 mètres de la maison. Beaucoup d'espace de stationnement. Plenty of room for 5 adults and 4 kids. Had everything we weren't able to bring traveling across the country! Nice home, accommodated 6 adults with ease. The house had an interesting interior that fit the mountain surroundimgs well. Relaxing yard too. Would rent again. This property is beautiful and very well maintained. We had an extended family of 9 for a 4 day stay. Everything about the property and location were excellent. The beds were very comfortable with nice linens. Plenty of towels were available. The log/rock house is well built and very comfortable and spacious. The property includes access to equipment such as horseshoes, outdoor fire pit, and three kayaks. 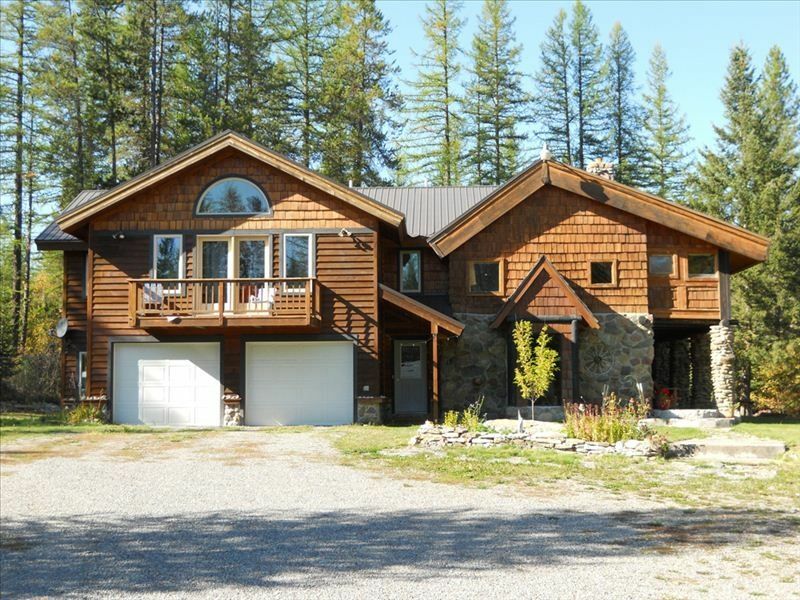 The location is perfect for easy access to Glacier National Park. We hope to return for another future vacation. Six people from our family stayed at this house during our trip to Glacier National Park, and we couldn't be more pleased. It was awesome. Plenty of bedrooms and, just as importantly, several bathrooms. Very clean and quite comfortable. We recommend this house highly. And Glacier NP is pretty incredible, too! Very unusual and beautiful home! The house is so beautiful and so unique. The stone work is incredible and the photos do not do it justice. The beds were very comfortable and the kitchen well supplied. The linens were all very nice. The house was immaculately clean and Amy was wonderful to work with. I would definitely stay here again! The house is only about 10 minutes from the west side of Glacier National Park, but the Going to the Sun road connecting the west side to the east side was closed due to the Sprague fire. It took 2-2.5 hours each way to get to the open areas of the park on the east side. Still, it was a beautiful drive and the scenery changed daily. Amy has walking sticks and bear spray available to use during the stay, which is much appreciated (we saw 5 bears during our trip). There are also tons of books and literature about the area available in the home. Thanks, Amy, for sharing the home with us! I took photos to show my friends the unique home, but they didn't turn out any better than the ones on your site. Truly, the photos do not do this home justice. FYI: Carolyn's Diner is a great place to eat, all homemade meals and bakery items, even though it is attached to a gas station. In spite of fires which closed the western part of GNP, we had a wonderful time partly due to the comforts of this funky log/stone home. I appreciated the large, well equipped kitchen, and a bedroom for everyone plus three and a half bathrooms. Location is excellent (or would have been without the fire), close to the western entrance to Going to the Sun Road and also just three miles from a lovely "lake" that put the supplied kayaks to good use. Outdoor space (porch with chairs and a picnic table) was great for conversation and badminton tournament spectating. Be aware that the internet is slow or non-existent(sit at dining room table) and there is no AT & T phone coverage - a real drag. Although there is badminton and kayaks available, you will need to figure out how to transport the kayaks yourself and set up the net as you can. We put it up between a tree and a corner of the house -- poles too high to pound in, as suggested). Air hockey table doesn't work. So, although comfortable and large, not every detail is carefully thought through. Amy was super nice to work with and tried to offer suggestions where she could. Local bar has terrible food but is willing to tune in to college football if you so desire (we did). We would certainly return here if we have the good fortune to visit Glacier National Park again!! cette maison est située à 1 mile de l'autoroute 2 sur une route pavée de comté. Il y a une haute clôture de protection en bois entourant la propriété. Il y a aussi une porte que vous pouvez fermer pour la rendre plus privée.